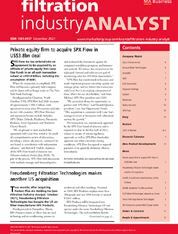 Filtration Industry Analyst is the only monthly source of business news, analysis and comment for senior professionals in the filtration and separation industries. Every month Filtration Industry Analyst reports on the latest trends, company and market news, investments, financial results, contracts, appointments and business developments in the filtration and separation industries worldwide. A unique combination of current news and expert analysis helps readers to compete more effectively in the filtration and separation sectors. Mergers and acquisitions, orders and contracts, appointments, joint ventures, marketing agreements, plant investments, strategy updates, job losses, new product developments, financing etc. An in-depth analytical look at the top manufacturers of the major equipment and media manufacturers, reviewing their structure, performance, strategic outlook and annual results, with comment and analysis.